Though summer is just about to end, the summer of recalls is still going strong. So far, there have been recalls of goldfish, melon, salads, and more. And now chicken is the latest food to threaten our physical well-being and become a major inconvenience. This voluntary recall comes from Wayne Farms, an Alabama-based chicken company that distributes nationally, and covers 438,960 pounds of "frozen, ready-to-eat, fully cooked" products. This time, though, it's not parasite contaminating the food. According to the USDA, the chicken “may be contaminated with extraneous materials, specifically metal pieces.” This applies to products with a sell-by date of July 4 and July 17, 2018. 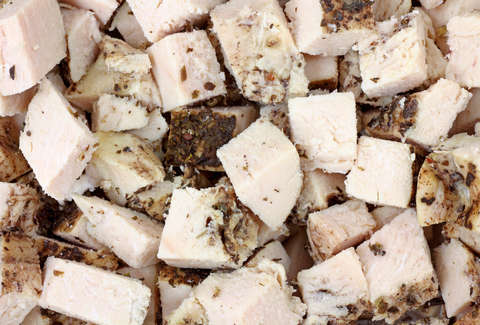 Definitely check out the full list, which includes fully cooked diced chicken and fully cooked grill chicken meat, but you should be able to identify the batch for sure by the establishment number "P-20214" on the chicken's USDA inspection mark. A customer complaint was issued on July 27, and Wayne Farms then reported the incident to the USFA's Food Safety and Inspection Service, and the recall was issued on September 5. Though the USDA is saying there have been no reported injuries so far, it's "concerned that some product may be in consumers’ refrigerators or freezers" and is urging people not to eat or cook with them if that's the case. If you believe you have any of these products, throw them out or return them to the place of purchase. You can also call Wayne Farms at (678) 450-3092.